The final batch of Frank West's "Capcom Heroes" costumes for Dead Rising 4: Frank's Big Package have been revealed. The grizzled war photographer will be dressing up as Jill Valentine, Viewtiful Joe, Arthur, Amatarasu, Morrigan and Bass. It is not a pretty sight. "Frank will be dropping the Bass, as he dons the classic outfit from the Mega Man series and dashes into action with new attacks, booster jets, giant metal blades, and a thunderous punch that will make zombies un-undead." Hop over to Capcom Unity for more images and details. Dead Rising 4: Frank's Big Package arrives on PlayStation 4 on December 5th. 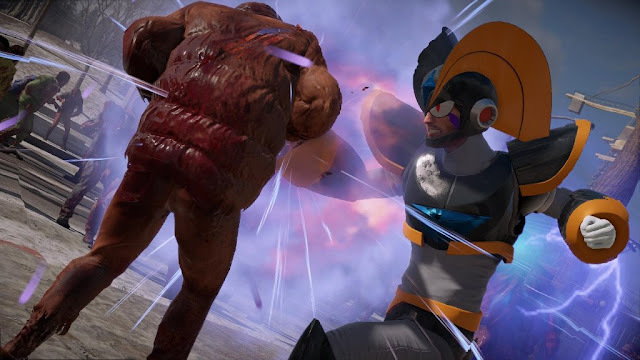 The "Capcom Heroes" mode will be made available to all Dead Rising 4 owners that same day, too. Why did they give the costume eyes? Everything else was fine... the eyes ruin it entirely. Um, maybe because that's art style? Hello? Have to admit, Frank West dressed as Jill and Morrigan is sort of hilarious. Eye-scarring, but hilarious. That Arthur run cycle made my day though. It looks so funny XD man that's great tho. that's a neat get up to punch zombies. If only the game wasn't a massive pile of stinking zombie crap.